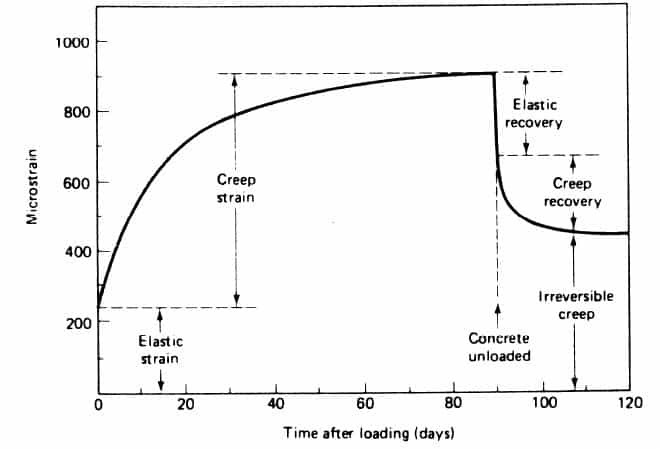 When load is applied on a concrete specimen, shows an instantaneous deformation followed by slow increase of deformation is called concrete creep. Creep is a time-dependent permanent (plastic) deformation under a certain applied load. Generally, creep occurs at high temperature (thermal creep) but can also happen at room temperature depending on the material (e.g. lead or glass), although this happens at a much slower rate. As a result, the material undergoes a time-dependent increase in length, which could become quite dangerous while in use. The rate of deformation is called the creep rate. 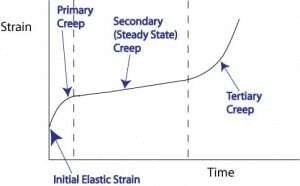 It is the slope of the line in a creep strain vs. time curve (see below). Reduce the effect of grain boundaries (use single crystal material with large grains). Add solid solutions to fill the voids in the material. Use materials with high melting temperatures. Consult creep test data during materials selection. When a load is applied on a concrete specimen. the specimen first shows an instantaneous deformation which is then followed by slow further increase of deformation. This slow increase of deformation, discovered in 1907 by Hatt, is called creep. There is always strain associated with applied stresses to any material. ASTM E 6-03 defines creep as “the time-dependent increase in strain in a solid resulting from force.” To define creep one must consider two identical specimens subjected to exactly the same environmental histories, one specimen being loaded and the other load-free (companion specimen). The difference of the deformation of these two specimens defines the instantaneous deformation plus creep. 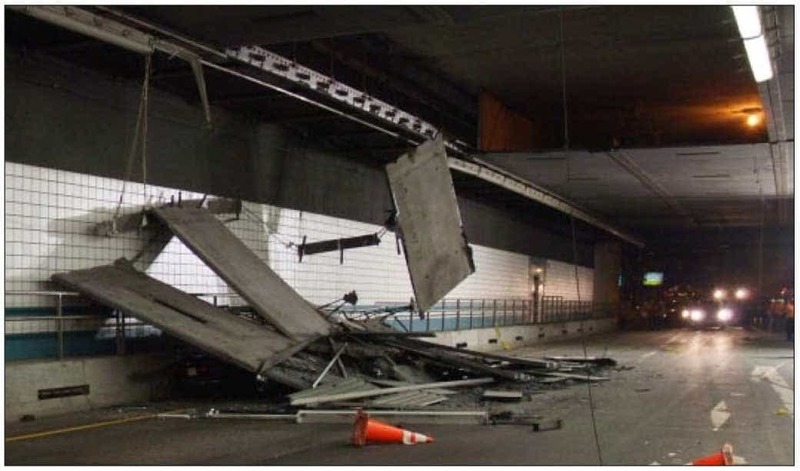 MacGregor and Wight explain that when a load is applied to concrete, it experiences an instantaneous elastic strain which develops into creep strain if the load is sustained. The magnitude of this creep strain is one to three times the value of the instantaneous elastic strain, it is proportional to cement-paste content and, thus, inversely proportional to aggregate volumetric content. 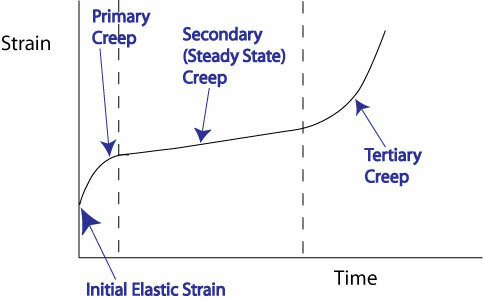 Creep can thus be defined as the increase in strain under a sustained stress; and since this increase can be several times as large as the strain on loading, creep is of considerable importance in structural mechanics. Under normal conditions of loading, the instantaneous strain recorded depends on the speed of application of the load and thus includes not only the elastic strain but also some creep. It is difficult to differentiate accurately between the immediate elastic strain and early creep, but this is not of practical importance as it is the total strain induced by the application of load that matters. If the stress is removed after some period of time, there is an instantaneous recovery of the elastic strain and then slower recovery of some of the creep, but not all. This is shown in Figure where the particular concrete was loaded at the age of 28 days, with the resulting instantaneous strain. The load was then maintained for 90 days, during which time creep is seen to have increased the total deformation to almost 3 times its instantaneous value. If the load were maintained, the deformation would have continued. I. 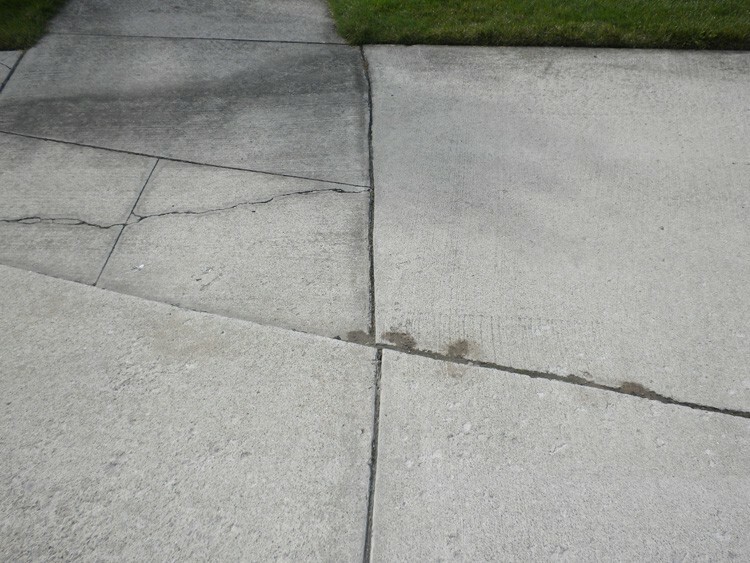 True or Basic Creep: is defined as the creep that occurs under conditions that there is no drying shrinkage or moisture movement between concrete and ambient environment. III. Drying Creep: is the additional creep that occurs when the specimen under load is also drying. IV. Creep Coefficient: is defined as the ratio of creep strain to elastic coefficient. Creep Coefficient = ε cr/ε E Creep and shrinkage of concrete are influenced by a large number of factors, which may be divided into intrinsic factors and extensive factors. 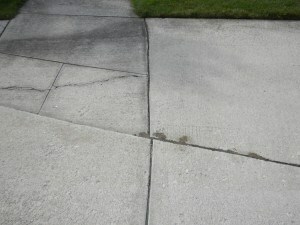 The intrinsic factors are those material characteristics which are fixed once and for all when the concrete is cast. Extensive factors are those which can vary after the casting; they include temperature, pore water content, age at loading, etc. The main intrinsic factors are the design strength. the elastic modulus of aggregate, the fraction of aggregate in the concrete mix. and the maximum aggregate size. Among the extensive factors we must distinguish the local from the external ones. The former. also called the state variables. are those which can be treated as a point property of a continuum. They are the only ones which can legitimately appear in a constitutive equation. Temperature, age, degree of hydration. relative vapor pressure (humidity) in the pores, and pore water content represent state variables affecting creep.